Back in the days when surfing was becoming very popular on the East Coast, Cocoa Beach, Florida was one of the hot spots. Joe's family lived there and in 1961 he learned to surf. His first board which was made by James O’Haira a board builder from California whom happened to be in Cocoa Beach at the time. The area produced some of the hottest surfers from the East Coast and Joe was their classmate. Joe had the opportunity to visit Hawaii in the summers while in his sophomore and junior years in High School. His father worked for Pan American Airlines and Joe could fly over at a discounted price. He liked being in Hawaii so much that he moved over in 1967. During that time Joe would work for George Downing in Waikiki Beach doing ding repairs and getting valuable advice from George in surfing. 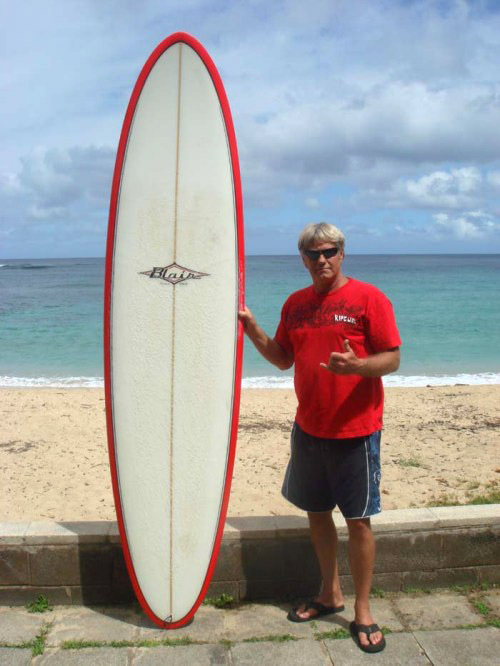 George would take Joe out to the North Shore and show Joe where to paddle out at on a big day at Lanni’s and showing him the tricks at Sunset, so Joe says he was one lucky haole. Able to fly around to many destinations for almost free Joe wanted to go to Puerto Rico and Barbados, so after saving some money he took off in the fall of 1969. Since it would be cheaper to have a board made in Florida, then Hawaii he went to Florida first and had one made. He asked for a flat bottom and turned down rails like the ones that were being made in Hawaii. The guys at the Tomb & Reeves shop where Joe had his boards made were not in tune with outlines and contours that the Hawaiians were doing and the board that they made for him didn’t ride very good in Puerto Rico. Joe would sell it in Barbados when he went there later on. Going surfing was the main thing for Joe and he was at the beach most of the time. One day at Rincon a guy had broken his board and was bummed. He asked Joe if he wanted his two piece board. Joe said yeah and took it back to Duke Michael’s shop outside of Rincon where he was staying. He skinned the glass off on both sides of that board and redrew the outline with a template he made from a Brewer board one of his friends had. The tail from that template had more curve and the nose area was narrower. (Little did Joe knew back then that he would be working for Brewer in the 70’s and 80’s). Having watched the guys in Hawaii make his boards he knew somewhat of how to go about doing the rail contours. Ed Searfoss who was over from New York glassed it Joe. Ed had brought fiberglass and resin with him to do ding repairs during his stay. After the board was re-glassed Joe took it out and the board rode fantastic. That was a confident builder that got Joe started in becoming a shaper. One day Duke Michael says to Joe let go over to a different surf spot. The winds were really blowing from the south and Rincon was blown out. They went around to the other side and Duke introduced Joe to Table Top’s. It was 4 to 5 ft. over head and smoking. Joe was having a blast, his board was working beyond his expectations, the board worked unreal Joe says. Within 3 weeks Joe and Ed were making boards in a little shop underneath the house where they were staying. The house was up the road from Maria’s and on a hill. Pabarojos was the town that they would get their board building supplies from. New blanks were hard to come by and expensive, so they would strip old boards and re-glass them. From September to March was the surf season on that side of the island and the busiest for board builders. It was near the end of the surf season and Joe says to Ed, I live in Hawaii why don’t you come over and build boards with me. That idea sounded distant from where they were but it found a place in Ed's mind. Looking out beyond their shop in Puerto Rico the landscape was a tropical jungle. 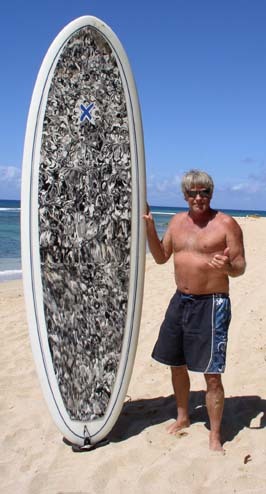 The following year Ed shows up in Hawaii and the both of them started working for Mike Horac at Country Surfboards. During the 1970’s Joe was making his own boards and working with other shapers. 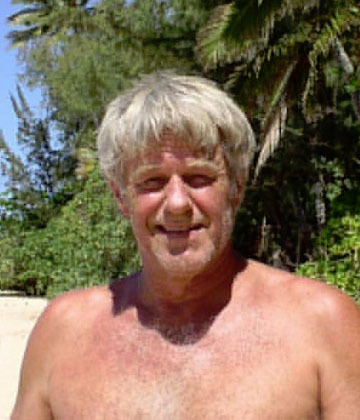 He would have a shop at Sunset Beach and made boards there. When windsurfing became popular in the 1980’s Joe got into making windsurfers and moved to North County San Diego. 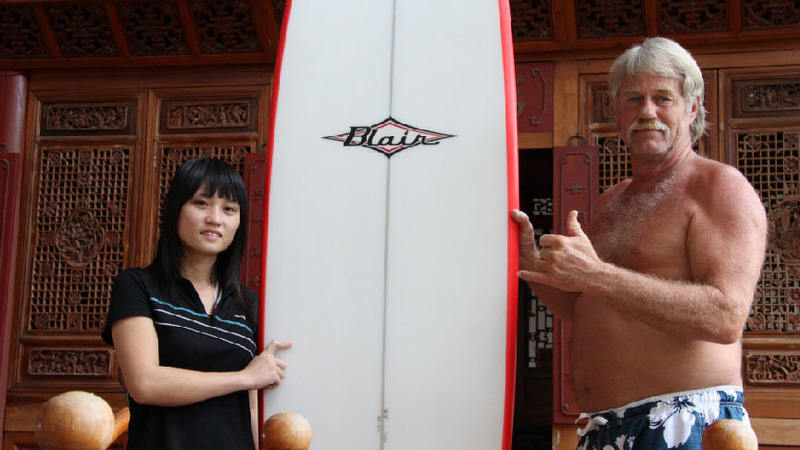 He made a ton of windsurfers during the 80's but the demand for them disappeared in the 90's. Many of the windsurfer were being made offshore and the market for local builders dried up. 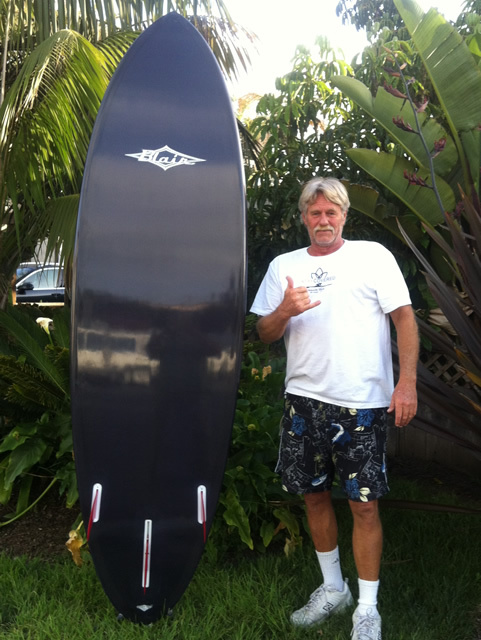 Joe continues to build surfboards and has added standup boards to his line of watercrafts. Joe had an article in Outside Magazine about his double winger quad using future system glass fins. The boards are made of epoxy and the fins are foiled like a windsurfer fin, which are thinner and they go through the water faster. Joe specializes in big guy boards where he customizes the roundpin quads by going 26 inch wide and 4 inch thick for guys weighing in the 300 plus lbs. size. Its a board that can be paddled fast and turn on a dime. Picking up ideas from his windsurfing day Joe learned having the fins placed further up, softening the rails and adding concaves made a world of difference. Even his fun boards have concaves. Explaining the benefits of a concave, Joe say a hot surfer can ride a piece junk of a surfboard, But the intermediate needs the best board they can, they don’t need a 20 year old design with no nose kick that pearls and a tail that can’t turn it. They need a board that they can have fun on. Something that they can improve on says Joe. They call me back and say “you know what Blair you made me feel like a kid again” That why I’m excited now says Joe, I’m specializing in making boards for bigger and older guys. Now they can rip like a kid again too.